Our Gospel message comes to us today from Luke the 13th chapter, beginning at the 1st verse. Repentance…. This is one of those familiar Christian words, often spoken by the so-called fanatic, fire-and-brimstone preachers on T.V., who try to literally, “scare the hell out of you,” so you qualify for heaven. Repentance…. Who wants to talk about such a subject? Even some recent surveys of Christians seem to indicate that there’s really no need to repent, for we are all basically good anyway. Therefore, the subject of repentance and even the word repent are rendered “relics of the past, obsolete, meaningless.” After all, “I’m OK and your OK.” Who needs repentance?! However, both the prophet in our first lesson (Isaiah 55:1-9), and Luke in our gospel today beg to differ! The prophet, writing to the exiled Jews in Babylonia and Jesus in our gospel; both insist that repentance is indeed relevant and necessary; repentance is not an option. Both the prophet and Jesus say that right now, today is the time to repent. Repentance is not a back-burner matter, which I’ll get to eventually only after I’ve done everything else. No! Rather, it’s an urgent matter, which I need to attend to right now, today. Martin Luther had it right when he said that every day is a day of repentance. Jesus, in answering the question about whether the Galileans killed by Pilate while they offered their sacrifices in the temple; or whether the 18 killed by the falling tower of Siloam got what they deserved because they were worse sinners than other folks; Jesus says: “No way!” God doesn’t work that way. He then goes on to tell them to look at themselves and their own lives, rather than the lives of others, he says: “No, I tell you; but unless you repent, you will all perish just as they did.” The parable of the barren fig tree is but a reiteration of this same point. After three years of not bearing fruit, the gardener appeals for a second chance, by giving the tree one more year to bear fruit, after which if it fails to bear fruit, then it can be cut down. Our lives are like that fig tree; God gives us only a certain amount of time to live on this earth. We don’t know when we are going to die. Therefore, we are given the opportunity right now, today, every day, to repent—to make peace with our God and one another and be prepared to meet our Maker, if our time is now. Lent is a good time to act on the urgency of repentance. Now, today is the time to do what needs doing, rather than putting it off or hoping, falsely that it will go away or look after itself. Seize the opportunity, “seize the day,” while it presents itself; otherwise it may never be there for you again. We are not God; we are given only a certain amount of time to act now. Some opportunities in life run out for us. We could be here today and gone tomorrow. Yet, in our sinful state, we often deny this truth. We say to ourselves, others and God, things like: “I’ve got to get everything in my life in order before I can start going to church and becoming involved. When I get the promotion at work, then I can go to fewer meetings and spend more time with my spouse and children. I don’t have to study for that exam until the night before. I can put-off visiting my parents and grandparents until next summer. Tomorrow I’ll quit smoking and drinking, after all, I can quit any time. There’s lots of time for me to get involved in the church; right now I’ve got to work on Sundays to make a decent living and keep my job. When I retire there’ll be plenty of time and opportunities to serve God and the church. What do I need to repent of? I live a good life, look after my family, pay taxes, and stay out of trouble. I’m going to hold a grudge against so-and-so because they don’t deserve my forgiveness. Let them come to me and beg my forgiveness. I’m never going to speak to them again!” Don’t these comments sound familiar? The prophet in our first lesson and Jesus in our gospel invite us to make the most of our time, which God has given us. Every day is a gift of God. We don’t know when our time on this earth will end, and we’ll meet our Maker. Our lives are in constant need of returning to the Lord—for that is the literal meaning of the word repent. Some days, our sin makes it necessary for us to turn 180 degrees in the opposite direction from the way in which we’re going, if we are going to return to God. May this Lenten season be a time for us to return to the Lord; to confess our sins; to forgive one another and be reconciled with one another. For our Lord is a God of grace; “he will abundantly pardon.” Repenting, returning to the Lord is thus not having “the hell scared out of you.” Rather, repentance is God’s gift of grace offered to you every day. May each day be one of thanking God for all of the opportunities we’ve been given to love and serve our Maker and each other. Let us pray: O Lord our God, good and merciful, I acknowledge all my sins which I have committed every day of my life, in thought, word and deed; in body and soul alike. I am heartily sorry that I have ever offended you, and I sincerely repent. grant that we may be ready to receive Christ when he comes in glory; that I may walk in the way of the righteous and offer praise and glory to the name of the Father, Son, and Holy Spirit. Amen. 1. From Andrew Greeley’s web site www.agreeley.com. The Bible texts of the Old Testament, Epistle and Gospel lessons are from the New Revised Standard Version Bible, copyright 1989 by the Division of Christian Education of the National Council of the Church of Christ in the USA, and used by permission. Sermon contributed by Rev. Garth Wehrfritz-Hanson. 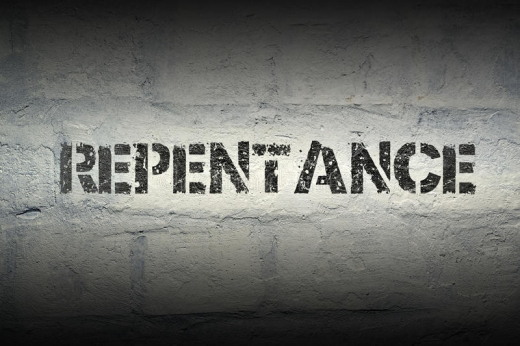 Repentance is an unpopular and misunderstood topic today. Many live in denial of the need to repent. God graciously provides us with opportunities to repent now, before it is too late.